Hello my friends! 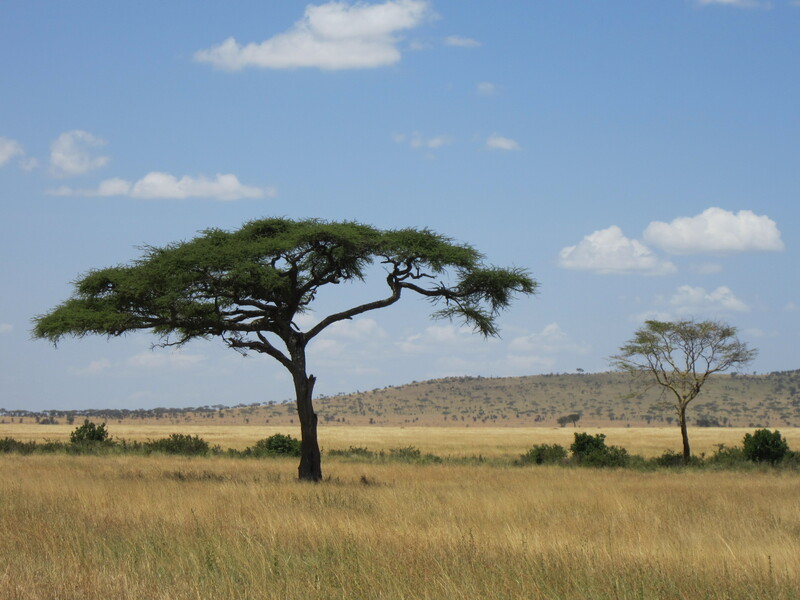 A few months ago I posted the Serengeti Eye Spy where I challenged all of you to find the well camouflaged animals in the Serengeti. 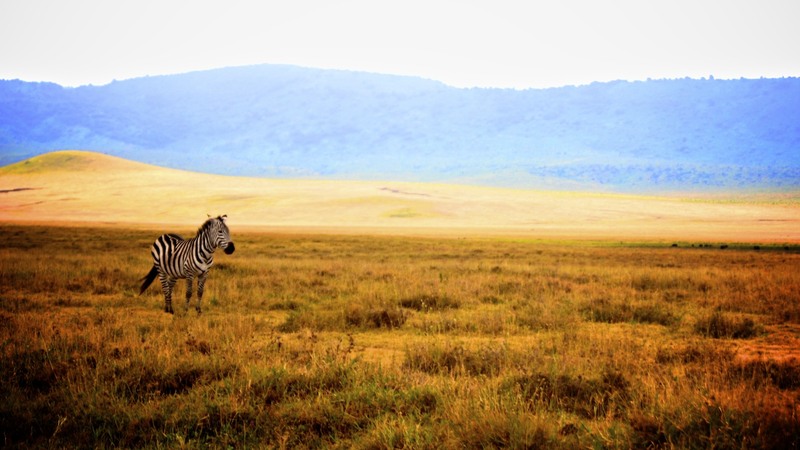 Although a little late, I wanted to post the rest of my favorite photos from my safari (which actually is a Swahili word for trip/voyage) to the beautiful Serengeti and the Ngorongoro Crater. 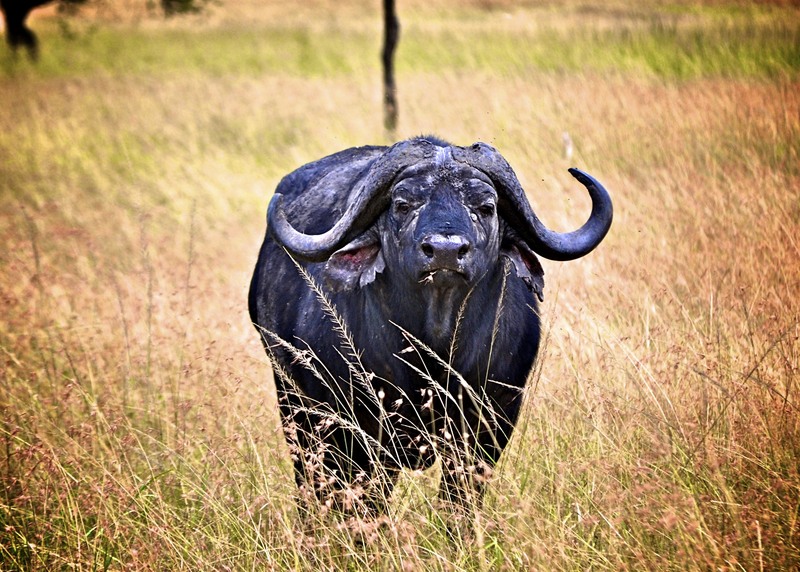 I have posted about going on safaris in other parts of Africa before and all of them were equally amazing. 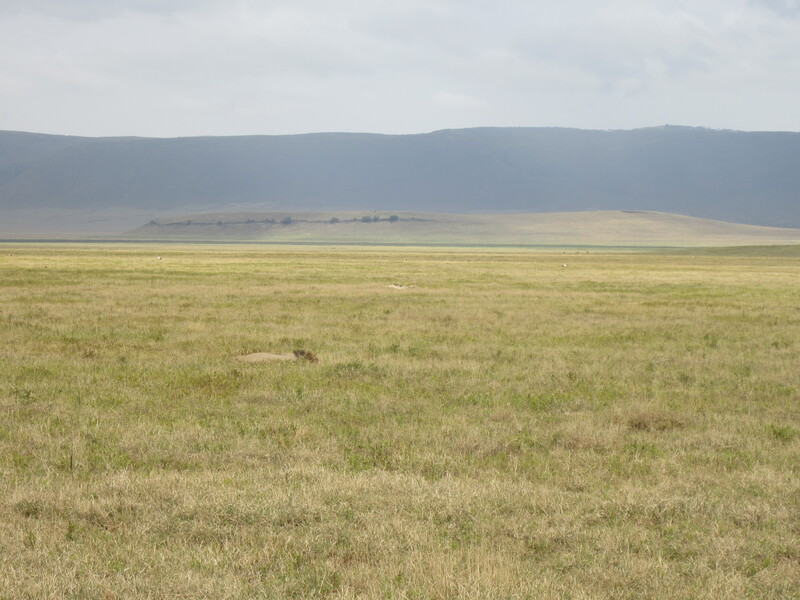 However, the four days I spent exploring the Serengeti and Ngorongoro Crater were beyond any expectations. 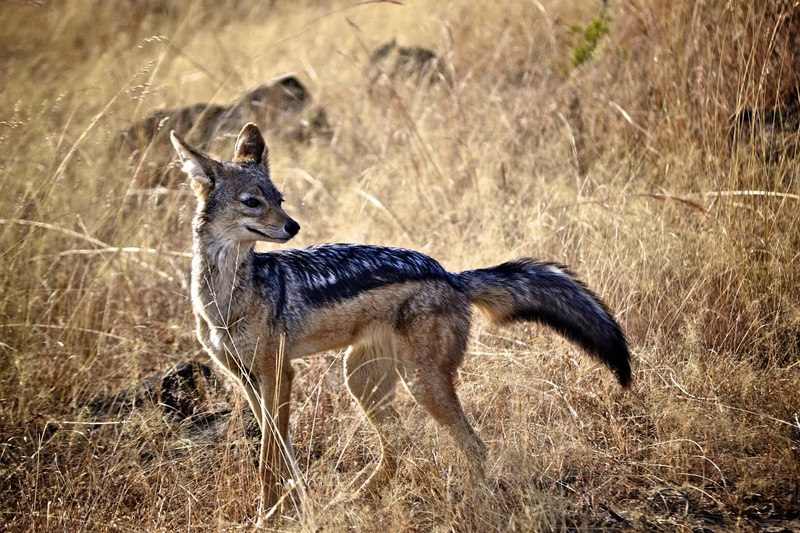 The landscape and the quantity of wildlife are simply unmatched anywhere else. 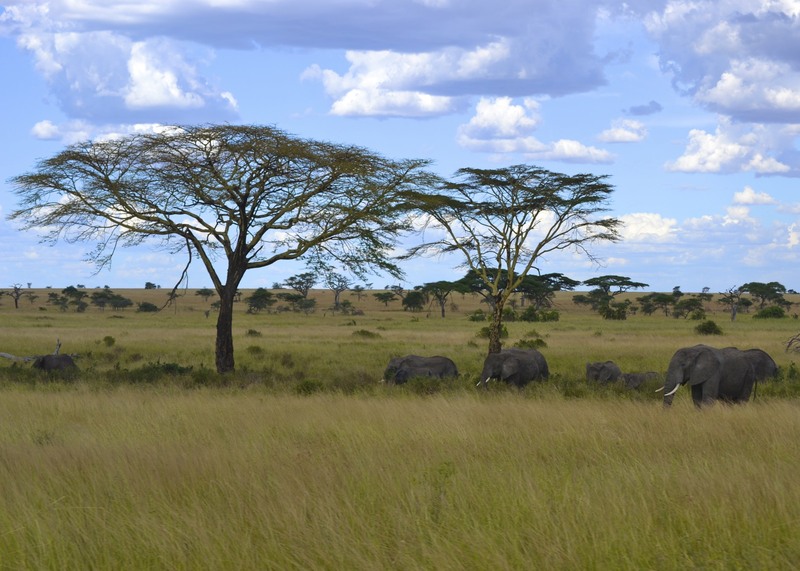 If I had to recommend one place for you to go on a safari it would be here. There are a couple of factors that made this trip incredible. First of all, the entire trip was extremely well-organized. My friend, Wilfred Moshi, from Kili Treks, set up the entire trip for us. 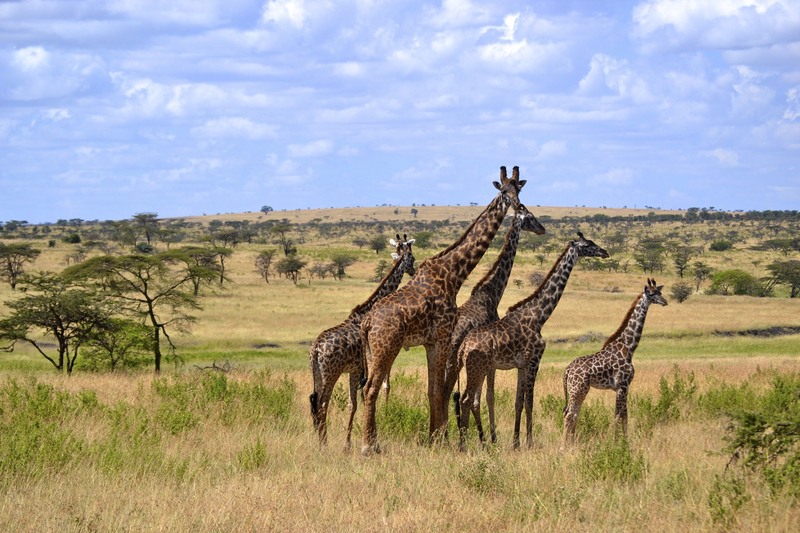 It was a package deal that included climbing Kilimanjaro with the follow on safari to both the Serengeti and the crater. Wilfred set us up with an English speaking local guide who had been working as a local ranger and a tour guide for the past twelve years. He was extremely knowledgeable and fun to have on the trip. The second factor was timing. We went in February, which was perfect for climbing Kilimanjaro because it was the end of the dry season. 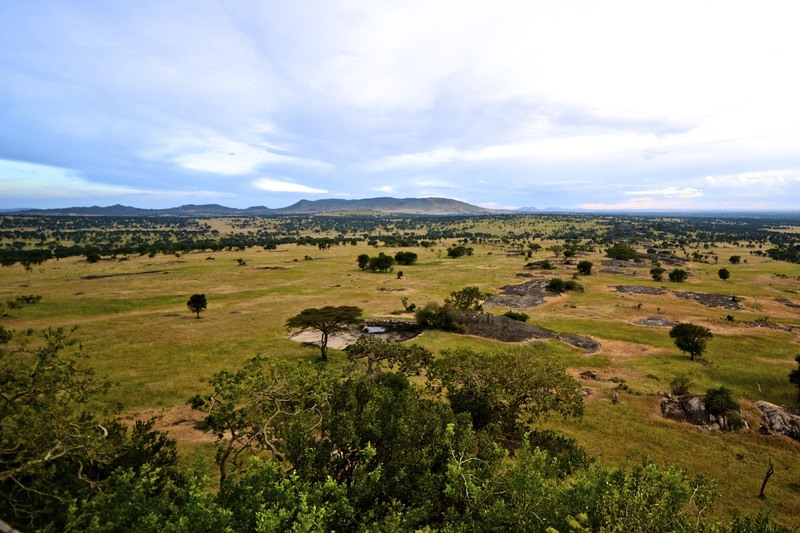 It was also perfect for the plains because it was the beginning of the wet season and the great migration. 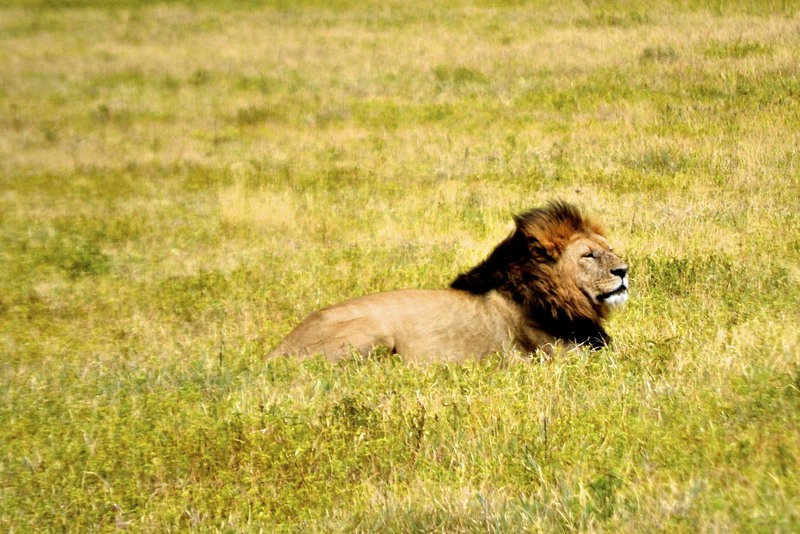 Translation: I was able to hike Kilimanjaro rain free and see a ton of animals. 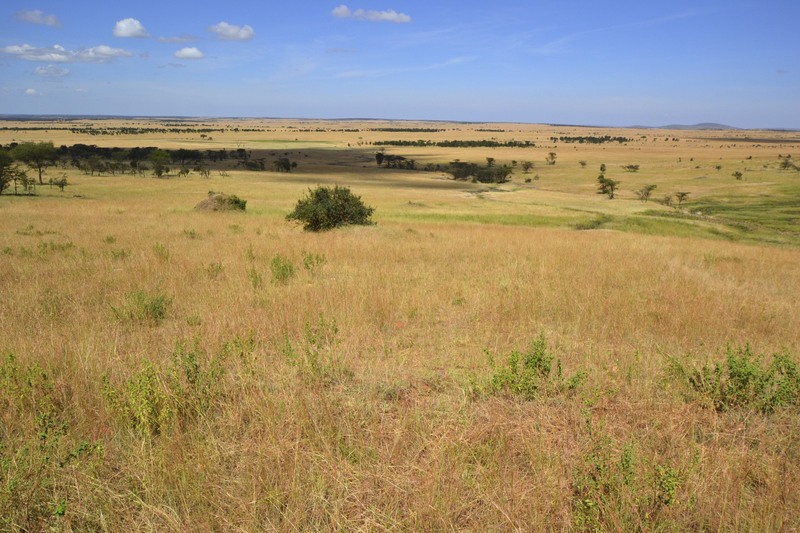 We were limited in time for the safari part and were initially worried that four days would not be sufficient. However, after sitting in a vehicle for four days we realized that it actually was the perfect amount of time. We are very active people and spending about 8 hours in a vehicle (this includes morning and afternoon, sometimes even evening game drives) is slightly exhausting and a little boring after awhile. 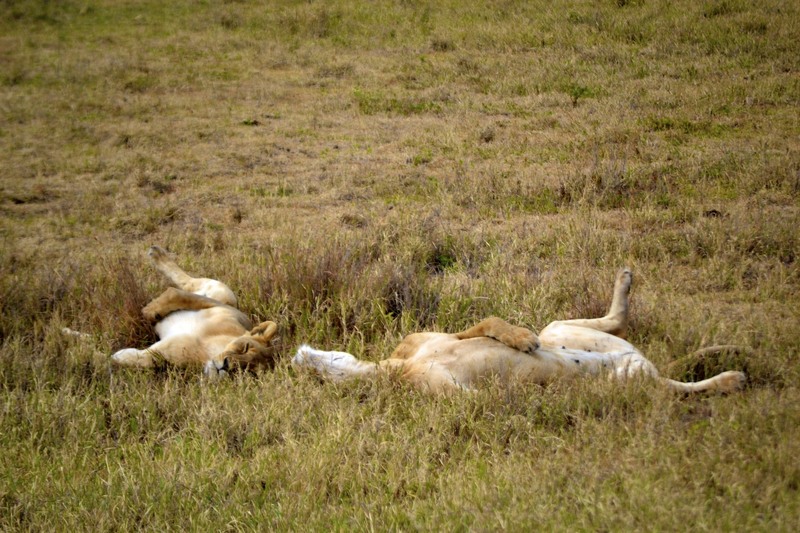 We had one rest day in between our climb and heading to the Serengeti. This was essential for doing laundry, re-packing and relaxing before the safari began. Our guide/driver picked us up early on a Monday morning and we set off towards the Serengeti. 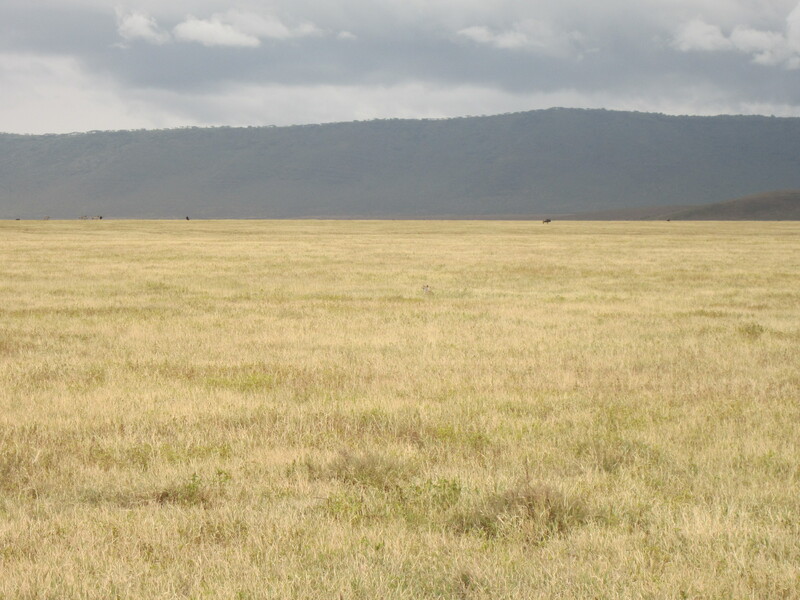 Our ride out to the Serengeti was really beautiful. I love passing by all the markets and watching the local people go about their lives. If your guide is good he will know all the best local souvenir shops to stop at. 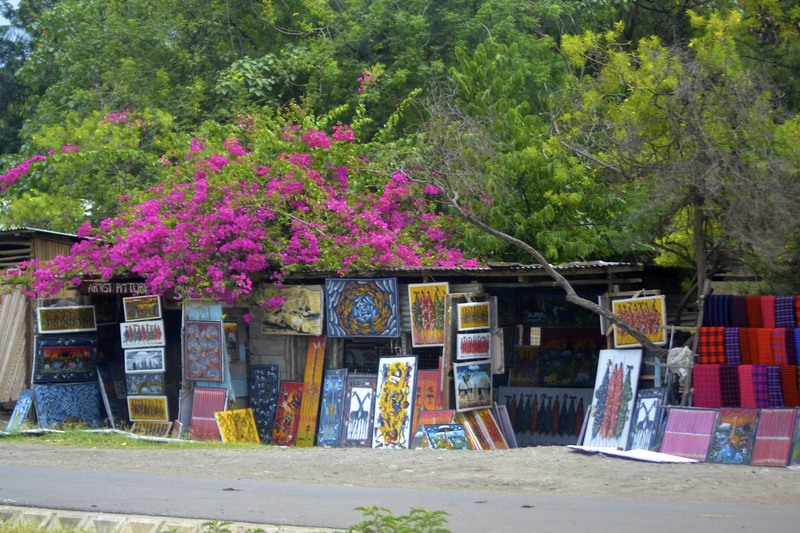 Many people love buying Maasai blankets and local art. 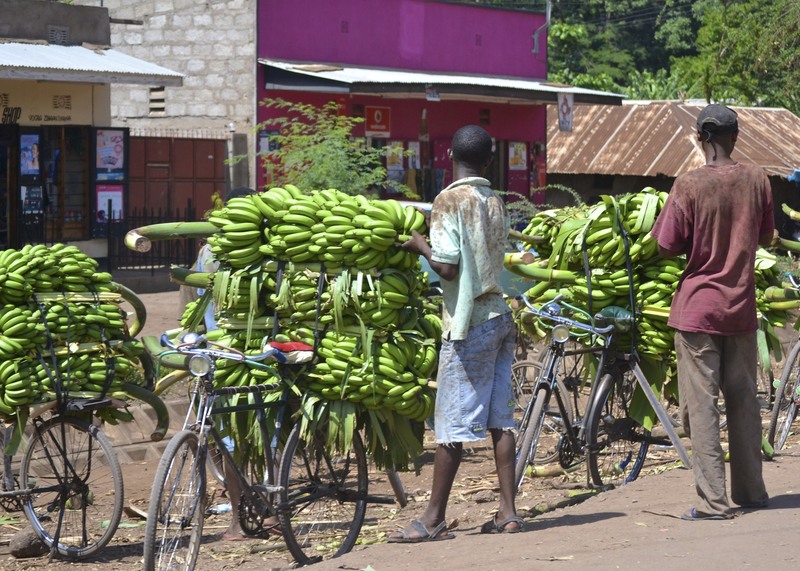 We also stopped to purchase some delicious bananas. Fresh fruits and vegetables are always readily available at cheap prices. Make sure you try at least something. By noon we had entered the park. The weather began to cool as clouds gathered and squeezed out raindrops. We passed a couple of Masaai men hovering close together under a tree trying to avoid the rain. I quickly snapped the picture to the right, mesmerized by the brightness and beauty of their traditional blankets. I have long been fascinated by the Maasai tribe and was extremely eager and excited to finally witness them in person. I am sure many of you have heard or seen documentaries about the famous Maasai warriors. They are famous for their brightly colored garments and maintaining a traditional pastoral life. I will have more pictures and information about the Maasai later on in this post. The rain lasted briefly and the heat momentarily abated. Since animals usually hide out and sleep during the hot afternoons we didn’t expect to see much. However, I was extremely surprised and very excited to spot a leopard on our very first day. I almost dropped my camera outside of the vehicle as I clamored out of my seat to get the perfect photo. 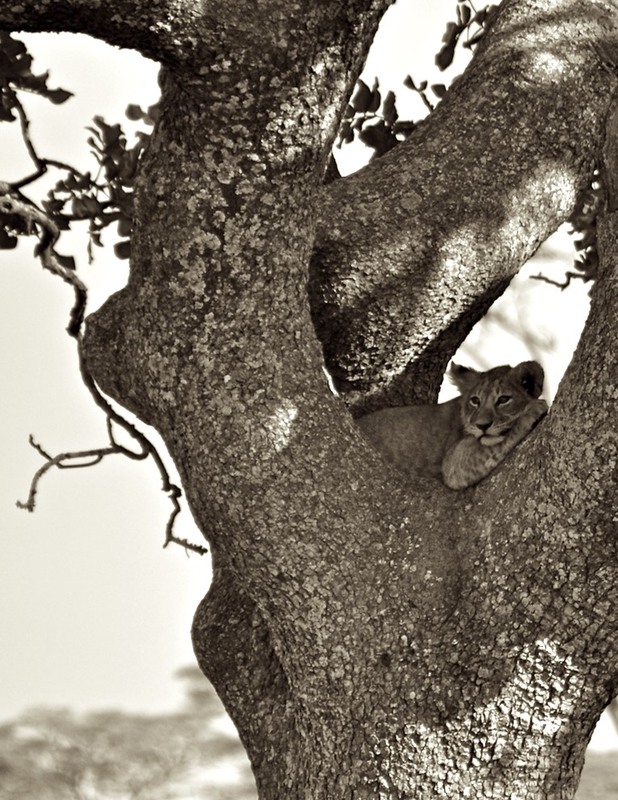 If you have been on a safari before you know how rare it is to a catch a glimpse of the beautiful cat. We also saw some beautiful giraffes and elephants on the way to our lodge. Already, it was turning out to be a very memorable safari. The highlight of my day (and probably my entire trip) arrived later on in the morning. As we were driving we noticed a bunch of safari vehicles focused on a tree. As we drove up and wedged ourselves into a spot we figured out what all the commotion was about. In the tree was a lioness. 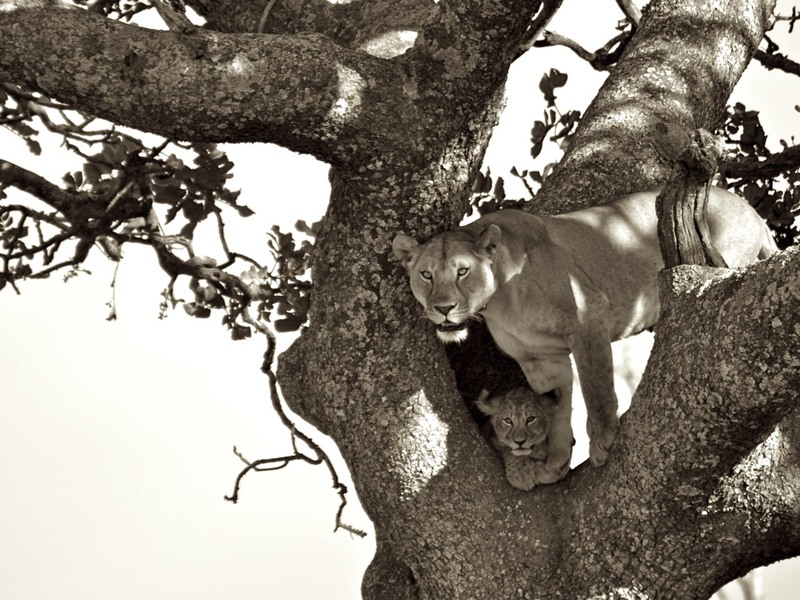 Although this in itself was incredible to witness, what really sweetened the deal was when I spotted two cubs at the base of the tree looking up at her. It was clear that they they were trying to figure out a way to join her. 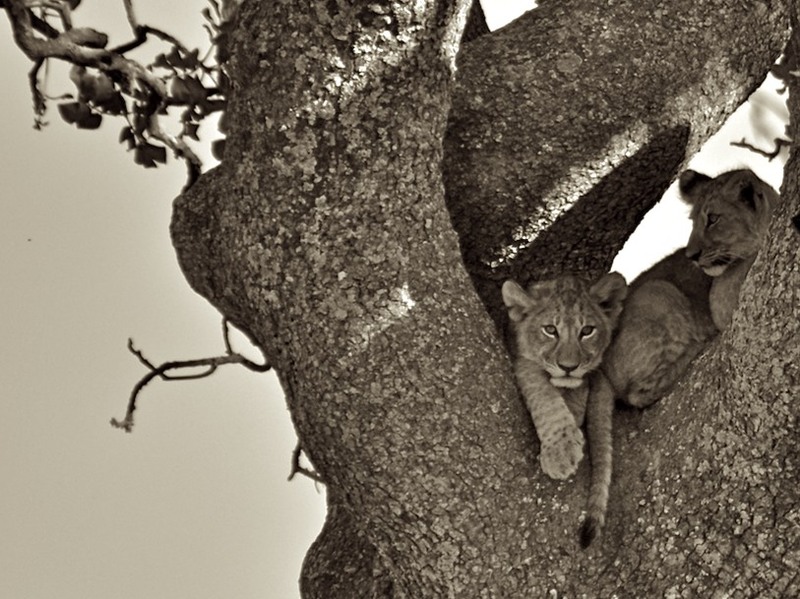 We watched and laughed as the two little cubs tried and tried to climb the base of the tree. Finally, they succeeded. 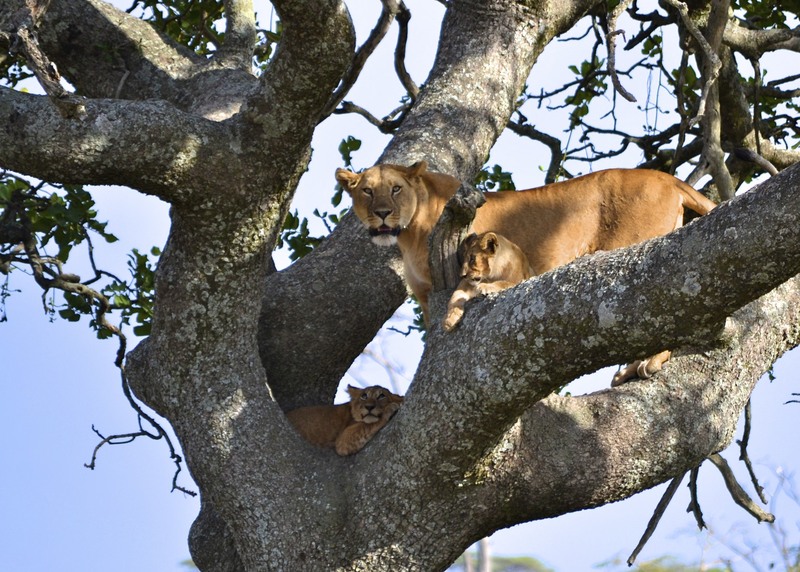 The family of three hung out in the tree for awhile. The cubs played together and tormented their mother like all children do. I took some of my favorite photos during this scene. 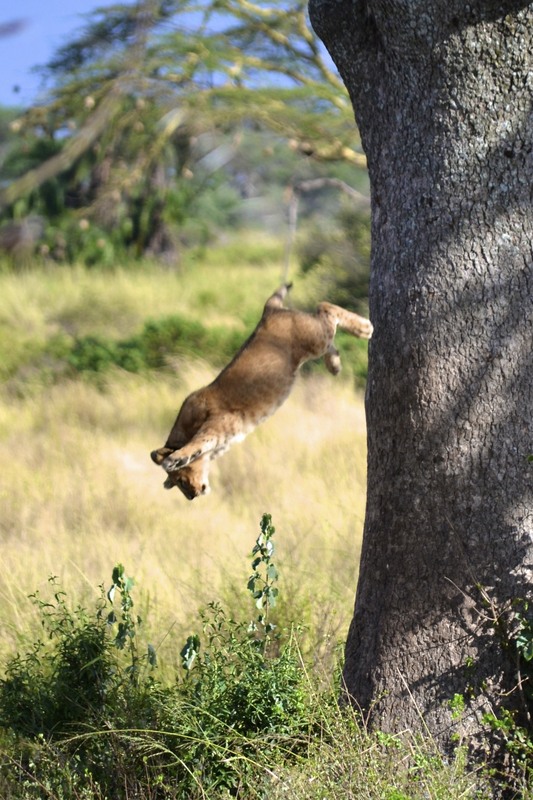 About 20 minutes later, the lioness decided she was done with the tree and suddenly jumped out. The cubs looked startled and had no idea what to do. They paced back and forth trying to figure out how to get down. You could tell they were really anxious but neither one of them wanted to take the first leap. The lioness just laid down at the base of the tree, ignoring them, and basically just waited for her children to figure it out. Finally, one of the cubs garnered up the courage to take the first leap of faith. I caught a photo of him, mid-air, paws outstretched. 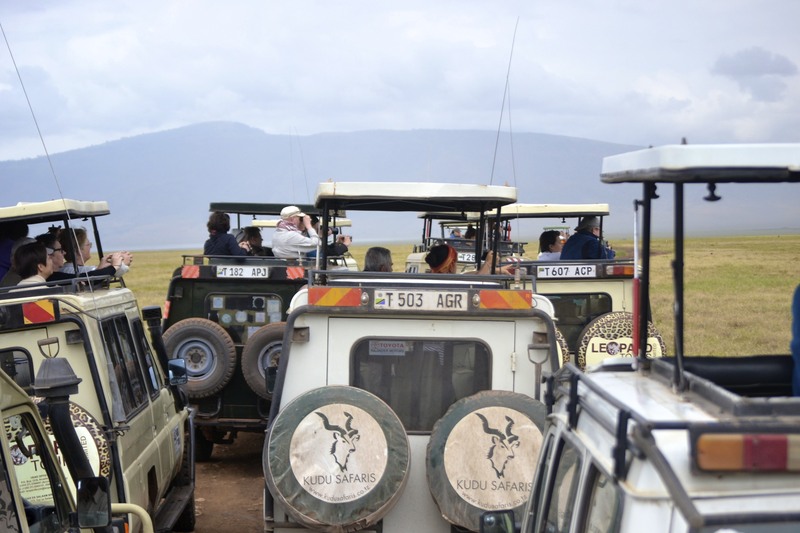 Everyone in the safari vehicles let out a little cheer and a round of applause for the cub. The second cub followed, however, only after making sure his sibling survived. This really was the coolest thing to experience. I hope you enjoy the following photos as much as I do. 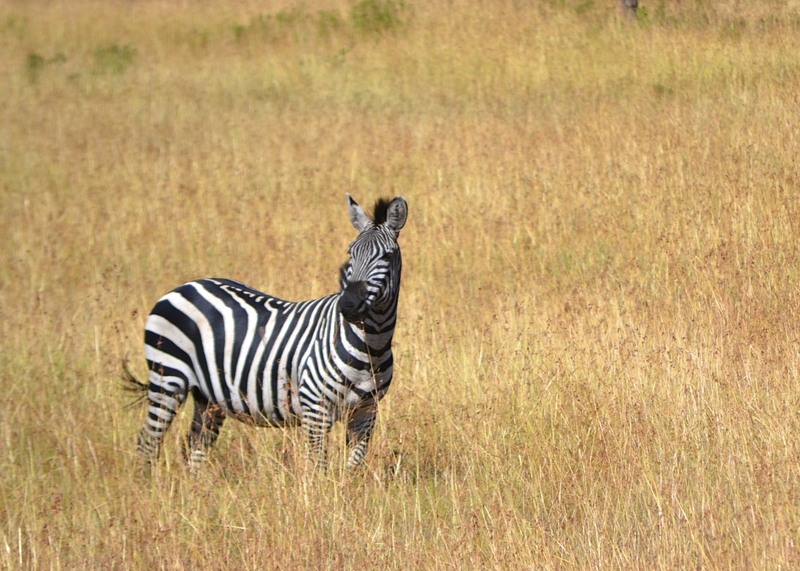 Going on a safari is like playing the ultimate game of Eye Spy. The one who sees the most and the coolest animals win. 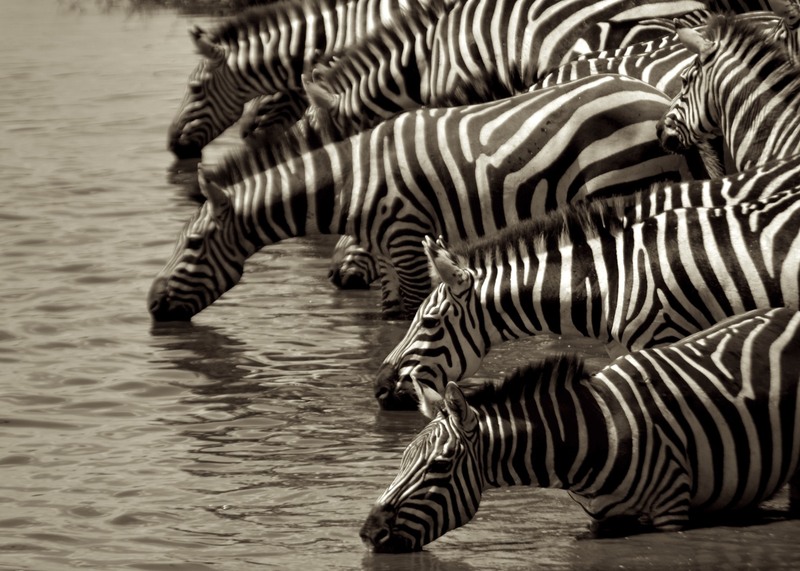 However, if the animals are beings elusive or your eyes are tired from constantly scanning the horizon then head over to a watering hole. You are almost always guaranteed to see animals hanging out and quenching their thirsts. 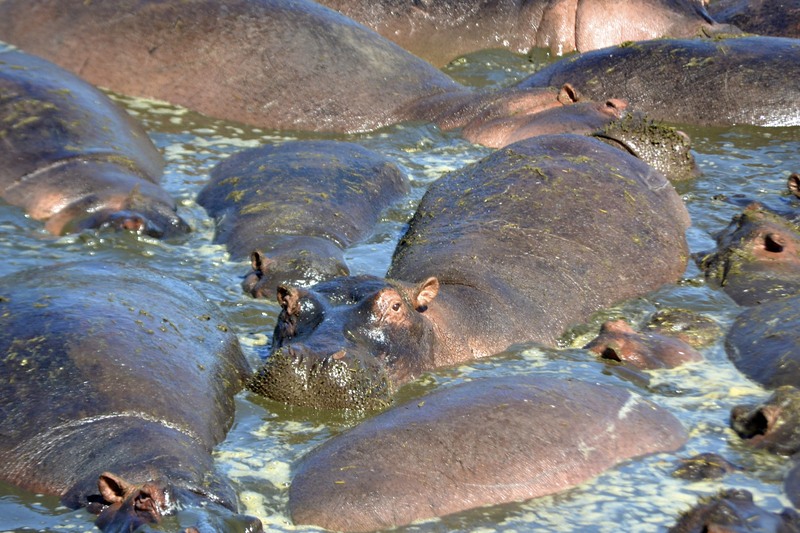 Whether its a huge group of hippos soaking in their favorite rivers or large packs of zebras and wildebeest, I promise you that you will never be able to put your camera down. There is something so incredible about seeing animals in their natural habitat that makes you NEVER want to go back to a zoo. 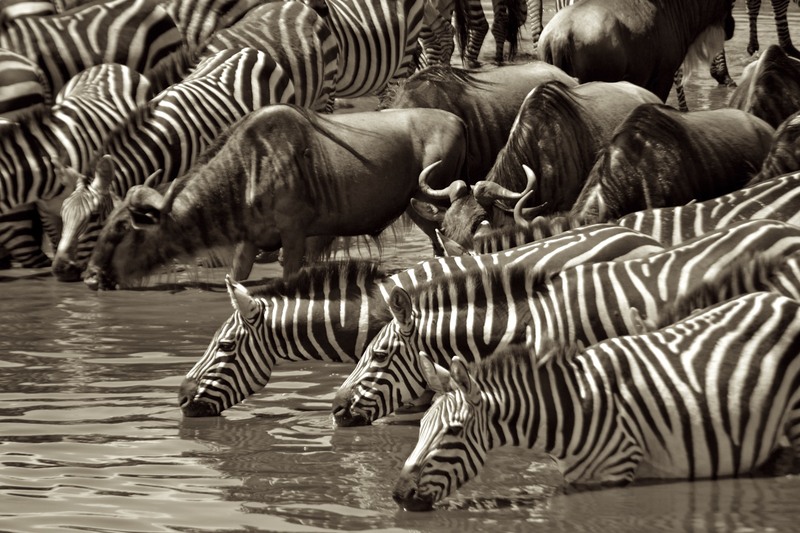 Due to our timing, we were fortunate enough to witness the great migration of zebras and wildebeest. 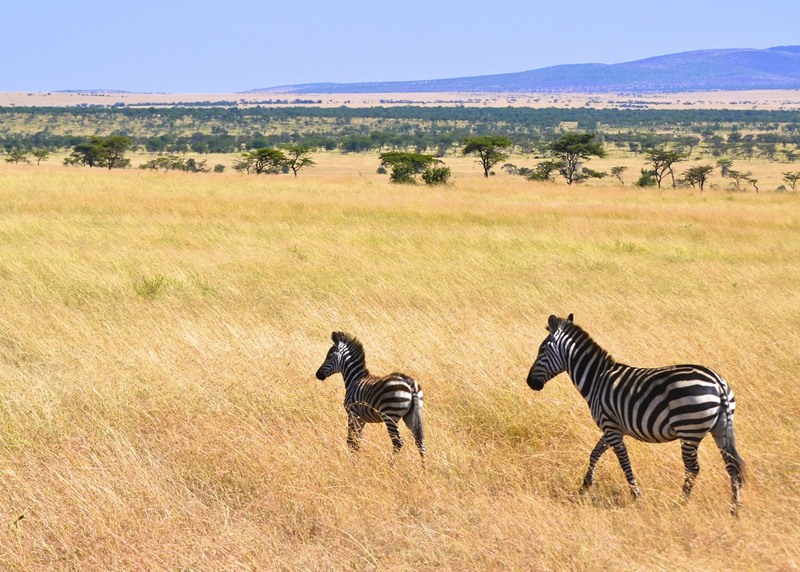 I couldn’t believe my eyes as I witnessed hundreds and hundreds of zebras and wildebeest trekking across the expansive Serengeti plains. Large groups were gathered together, munching on grass and avoiding the sun under trees; others traveled onwards in single file lines. Just this in itself was worth the trip to Tanzania. 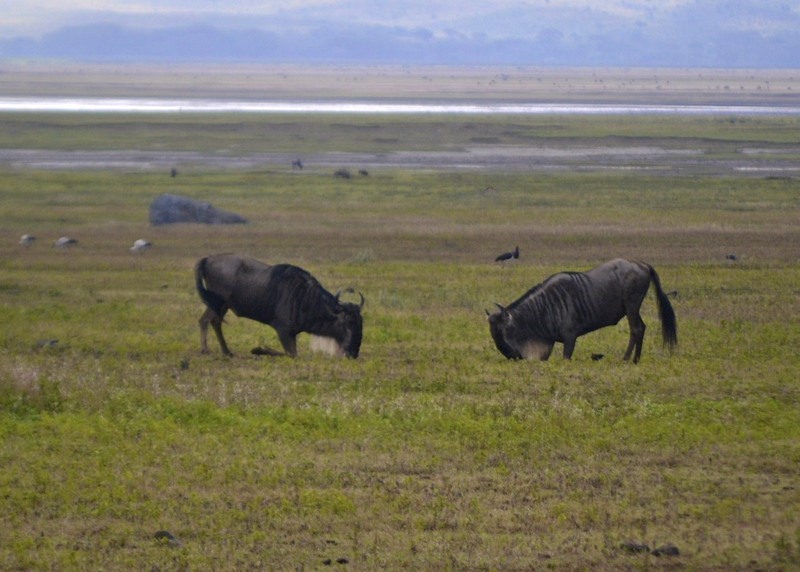 On the third day of our safari, we headed out of the park towards the Ngorongoro Crater. 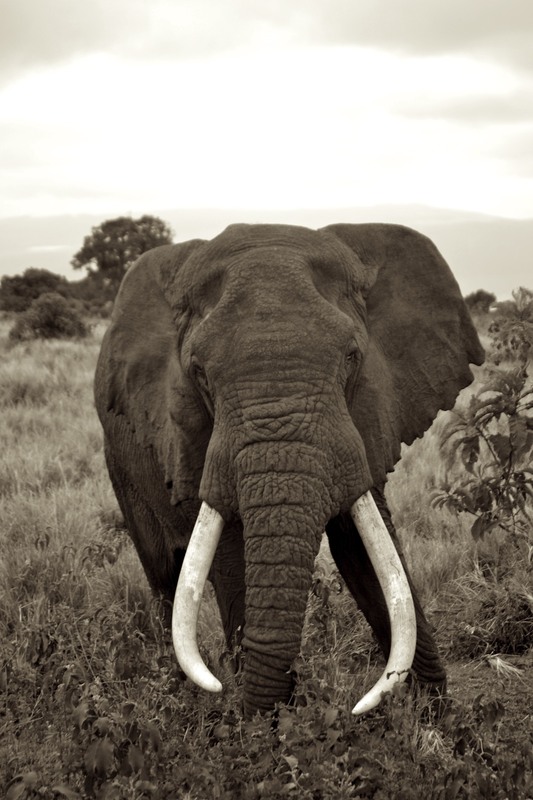 Before exiting the park we saw this very old elephant with the longest tusks I had ever seen. 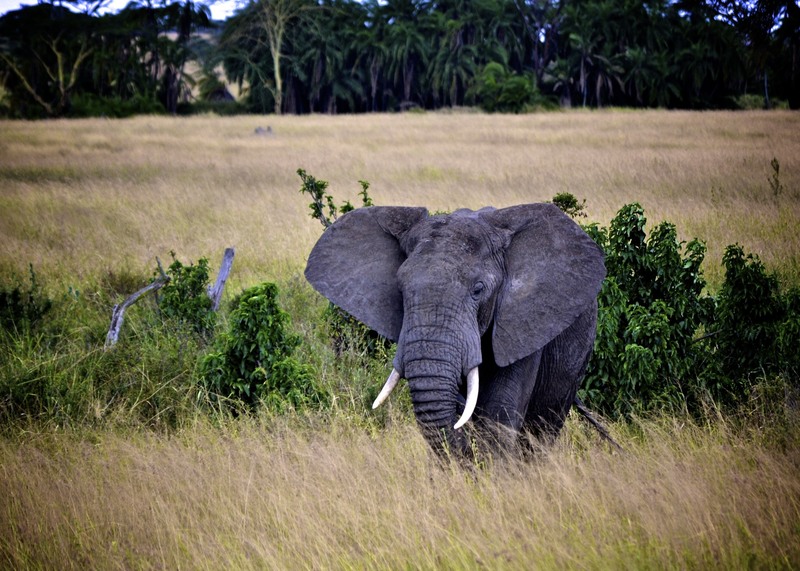 As we passed him I said a little prayer in hopes that poachers would never find him. 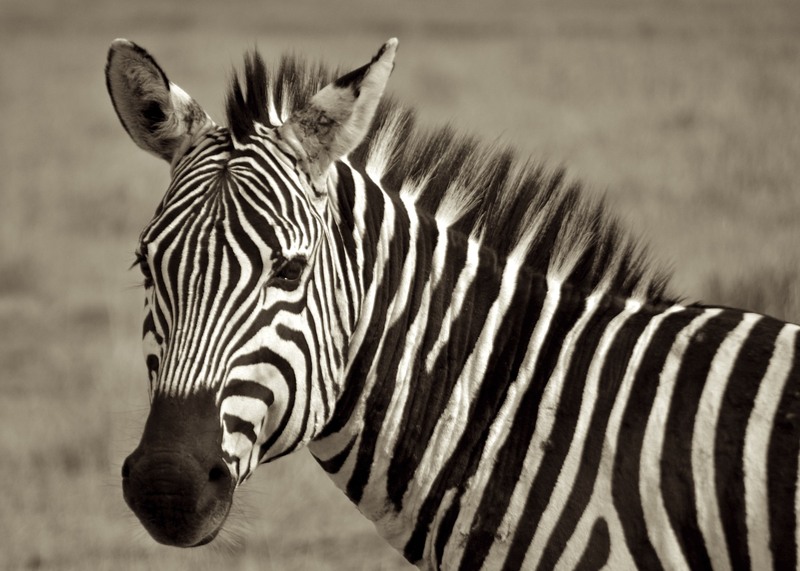 Although there are now strict laws protecting the animals from poaching, the horrible and disgusting act still occurs. It is something that I will truly never understand. 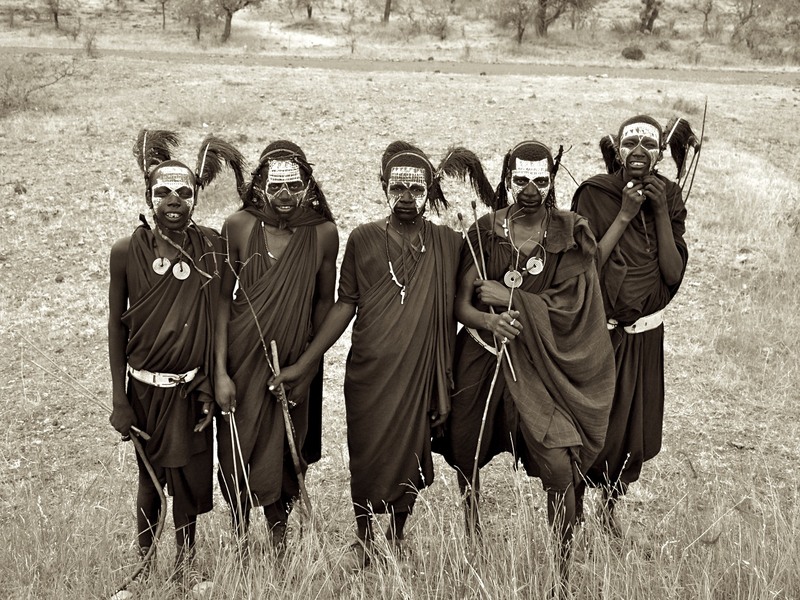 As we drove out of the park and towards Ngorongoro we caught a glimpse of some Maasai boys in their tribal regalia. 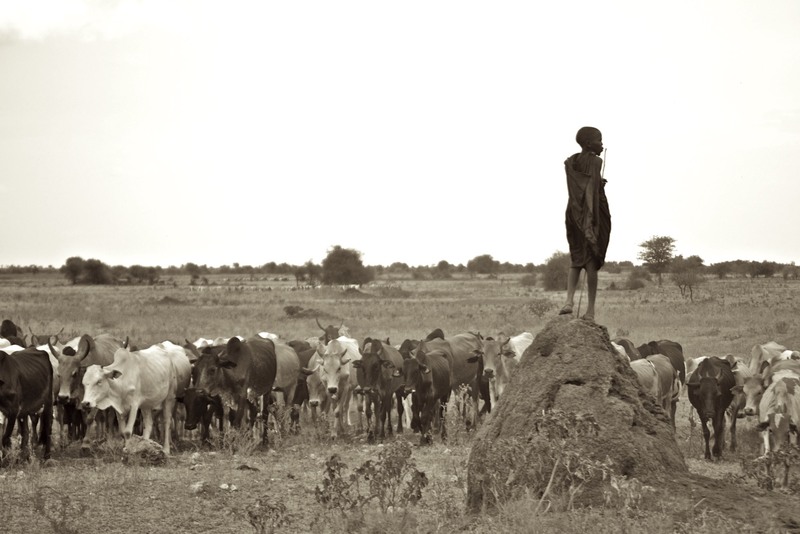 The Maasai are traditional cattle herders and their wealth is determined by the amount of cattle they own. 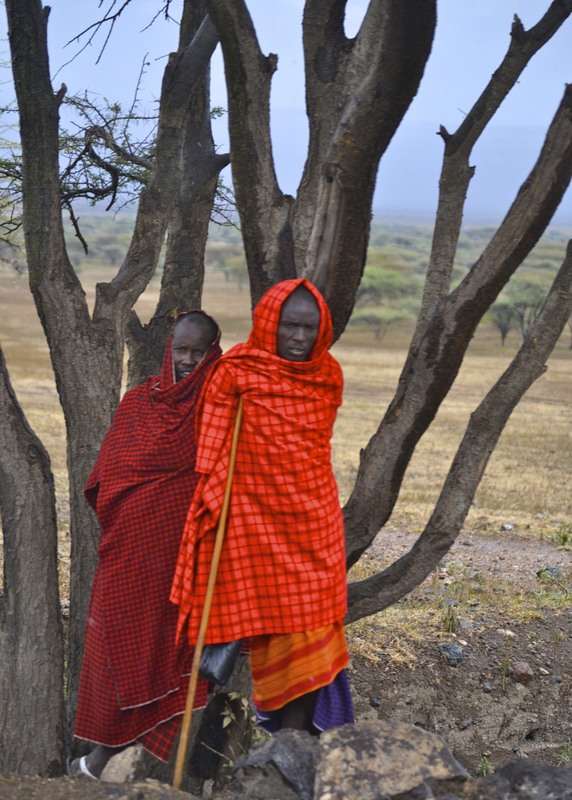 The Maasai society is based on age groups, especially with men. According to a Maasai Warrior site, the groups are young boys, junior warriors, senior warriors, junior elders, and senior elders. Men do not move from one stage to the next at any specific age, but rather when the elders decide. Boys get to be boys until they somewhere between the ages of 12 and 25, when they go through the painful ritual of circumcision to become junior Maasai warriors. The first two photos below are of junior Maasai warriors. Although I am not exactly sure if this is a pre or post circumcision photo. All of the boys seemed to be in good moods so I am going to take a guess and say that this is a pre-operation pic. Also, Maasai generally do not like having their pictures taken. However, they will oblige if given a little something in return. I generally stand by my rule of not giving out any money, but I really wanted this photo and at the end of the day, I am very glad that I did. 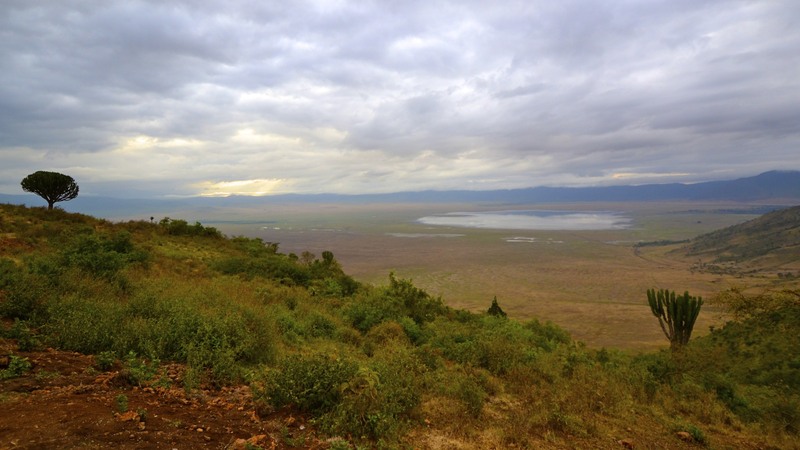 We spent an entire day and a half exploring Ngorongoro Crater. As we descended into the huge crater, our mouths literally hit the floor of the vehicle. It is incredibly beautiful and incredibly large. The crater was formed when a giant volcano exploded and collapsed on itself some two or three million years ago. 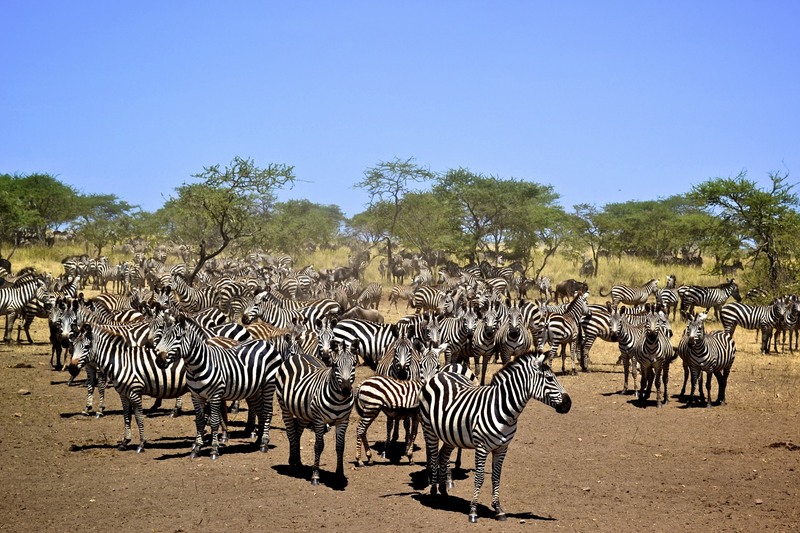 About 25,000 large animals claim the crater as their home. 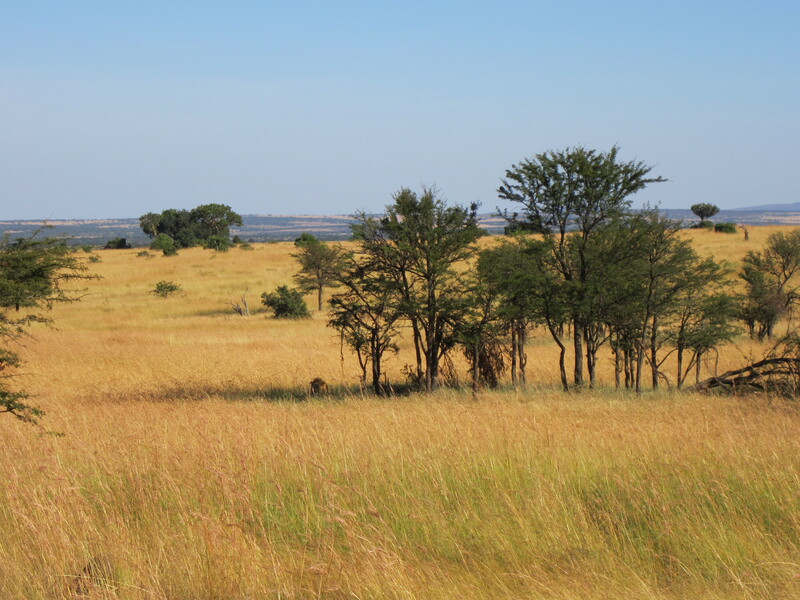 Everything from Black Rhinoceros and lions to leopards and cheetahs are found in the crater. Within the hour we had spotted lots of animals. 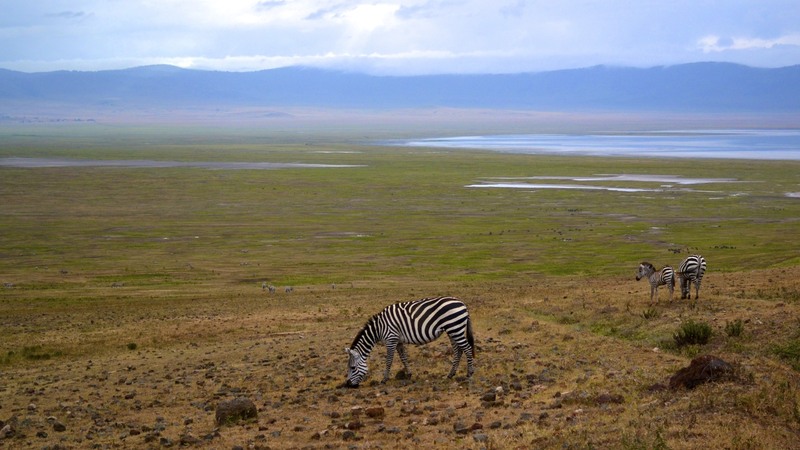 The first photo of the zebra in this post was taken in the crater. 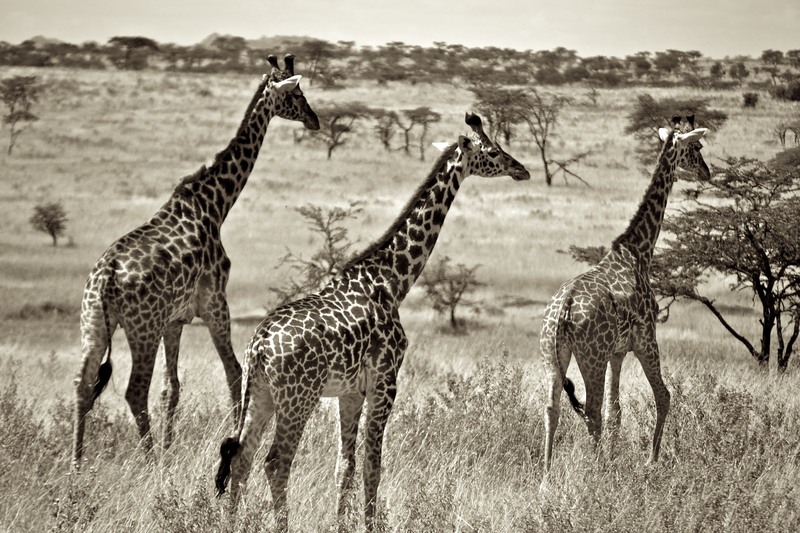 However, with the abundance of animals comes the abundance of tourists. Some times it is frustrating having so many people around. However, I have to remind myself that it is all part of the tourist industry and the money made benefits the park and the animals. Below are some photos of some very lazy cats. As soon as a vehicle would stop, a hundred other vehicles would race to join them- eager to find out what was lurking in the fields. The cats below garnered a lot of attention. It was quite humorous how everyone, including myself, were glued to their cameras and eagerly awaiting any type of movement. As soon as an ear or tail twitch you would hear thousands of cameras click simultaneously. I must have taken hundreds of photos within a few minutes. I look at the above photos and can’t help but laugh. I mean talk about the life! We waited for an hour, left, and then returned two hours later to find these ladies still in the same spot. Good thing I didn’t miss anything! At the end of the safari we had seen a ton of wildlife, to include three leopards, two cheetahs, rhinos, tons of lions, and everything else you could think of. It was by far the most of amount of wildlife I had ever seen. I can’t say enough about how beautiful Tanzania really is. If you want to experience a trip of a lifetime then I highly recommend going here. It is very safe and Tanzanians are wonderful people. The tour industry is also very well developed and you will have a great experience with seasoned tour operators. I can’t speak highly enough of ours, so if you are at all interested in a combined Mt. Kili/Safari trip then email my friend Wilfred. Wear: Dark/earth tone colored clothing. Recommend hiking pants that have the zip off legs. Its cool in the morning and hot in the afternoons. DON’T be that person in bright pink. Bug spray: tsetse flies are extremely annoying and love to attack you when you are in the car. Thanks again for reading. I really hope you enjoyed this post and my photos. If you have any questions please do not hesitate to ask me. Hello my friends! It truly has been ages. I know…I sort of disappeared. It was not my intent to stop blogging all together, but the last few months have been ridiculously busy and I simply was unable to keep up with this blog. I was constantly faced with the decision to either stay in my hotel and write and edit photos or go out and actually explore the countries I was visiting. So I chose the later, in hopes that once things settled down I would be able to start blogging again. Well guess what? The dust has finally begun to settle and I have a few weeks to edit photos and write more posts before I (tear) move back to the states. The fun had to stop eventually (and the money run out!) before I returned to a semi-normal life. However, until then I have a ton of trips planned around Europe, to include a wedding in Istanbul! All and all, I am excited to be back. I have a ton of beautiful photos to share with you from my trips to Ethiopia, Tanzania, Senegal, Gabon, Ghana, South Africa, Slovenia, Croatia, and Italy. Yes, i have been to all those places since I last blogged. Thank you again for your patience, understanding, and support. 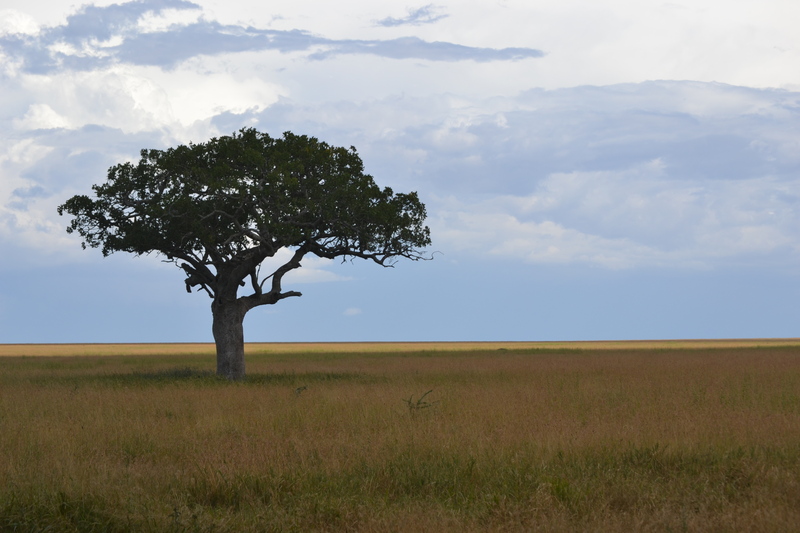 I took this photo while on a safari in the Serengeti National Park, Tanzania. Can’t wait to share the rest with you! Hello my friends! After climbing Mt. Kilimanjaro I headed to the Serengeti and Ngorongoro Crater. Our safari guide was a very nice Tanzanian man from Arusha. He worked in the Tanzanian National Parks for twelve years and has been guiding for the past four. His depth of knowledge about animals was very impressive and he had an amazing ability to spot even the most elusive animals. So I decided we would do something a little fun today. 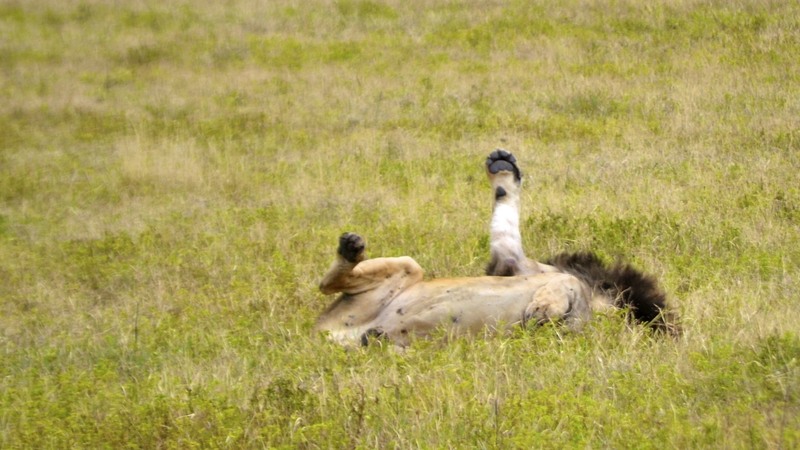 Below are pictures I took while on my Safari. I used my regular kit lense (so these are the actual distances between the animals and us) and did not alter any of the colors. Can you spot the animals below and tell me what they are? Are you as good as my guide? Make sure to put your answers in the comment section. Good luck and check back in tomorrow for the answers!